More info:Please note: this fast-paced and affordable trip is designed with the 18-to-30-something traveller in mind! Supporting local culture and businesses: There are a multitude of opportunities to support local businesses and immerse yourself in the cultures of these countries on this trip. From the colourful markets to the bustling food stalls and cafes, the choices for eating and handicrafts are endless and the money is staying in the local economy - a vital way for tourism to make a positive impact. Activities that take you to markets, locally-owned restaurants, community projects, NGOs, locals’ homes and villages are vital to the local peoples’ ability to truly benefit from tourism. Our style of trip, travelling and eating with the locals, puts you right at the heart of Southeast Asian culture. The kaleidoscope of culture to discover on this trip includes Thai, Indian, Malay, Chinese, Arab, and Tamil as well as the various religions to be observed in the beautiful temples of Buddhism and Hinduism and the Mosques of Islam. Singapore’s multi-ethnicity is evident in its four official languages! It may not be apparent that learning about and respecting other cultures is part of being a responsible traveler, but we believe that this discovery is a natural way for people of all backgrounds, nationalities, and religions to interact and learn from each other, fostering peace and understanding. And it’s just plain fascinating! Thailand: Get a traditional Thai massage at the school of massage in Wat Po, see rubber plantations, go rock climbing, snorkeling in the Adaman sea, observe local wildlife, take cooking classes, and go sea kayaking. Malaysia: Experience the colonial architecture, visit Chinese shop houses, witness the merging of cultures with Indian Temples, Chinese Temples and Mosques, visit tea plantations, colonial hill stations, trek through the jungles, see local flora and fauna such as the Raffleasia plant, local festivals and festivities, try Baba Nonya Cuisine, and visit former Chinese mansions. Singapore: Immerse yourself in a variety of cultures by visiting the unique Arab quarter, Little India and Chinese food halls and temples, try a variety of local cuisines influenced by Singapore’s multiculturalism. Low Impact Transportation: South East Asia has lots of options for getting around making less of an impact. We always try to use local transport. 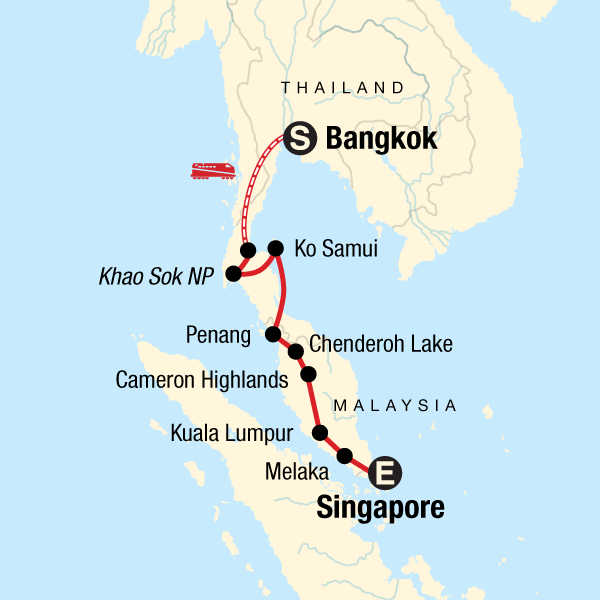 This trip gives you the chance to try out the public buses, overnight sleeper trains to go from Bangkok to Surat Thani in the south of Thailand and of course the famous Tuk Tuks, cycle rickshaws, longboats and Songtoews. Getting around as the locals do not only allows you to experience the culture on a deeper level, but the same way it is at home, using public transport is the most sustainable way to go – after walking and cycling of course! This company has operated on responsible tourism values since its inception. From an environmental perspective, our initiatives extend from our company offices to our tours. Our head office and stores are powered by a local green energy provider, we encourage cleaner transportation methods for staff, and purchase all supplies from a local green business supplier. Our office is as paperless as possible and our brochures use 100% PEFC certified sustainable paper. We offset emissions from all corporate flights and our marine vessel, and encourage our travelers to do so by providing an online platform through Sustainable Travel International. Supporting communties is and always has been at the heart of our tours. We provide business opportunities to local people by employing local guides and tour operators. The majority of accommodation used on our tours are small-scale, locally-owned hotels. Our tours mainly use public transportation wherever possible and are small in size to keep our impact on fragile sites and communities as minimal as possible. We monitor the sustainability of our tours through traveller evaluations in order to allow for continuous improvement. We support the local economy and business initiatives by visiting locally-owned shops, restaurants, and markets on our tours. Many tours incorporate community projects as a way of supplementing community income and supporting community development projects. In 2003 we founded a non-profit organization as a way for our travellers and our company to give back to the people and places we visit. We develop community projects around the world in the areas of health, education, small business development and environmental conservation. Funds are raised through traveller donations and fundraising. The company pays all administration fees which means that 100% of each individual donation goes directly to the community projects. Each year, we continue to support and develop new partnerships with more community projects and community-based tourism initiatives worldwide, in Latin America, Asia and Africa. Tour leaders provide travellers with information about local environmental issues in their respective regions, and provide suggestions of how we can best protect the local environment and culture. To reduce the amount of waste created on tours, tour leaders also encourage travellers to use refillable water bottles instead of disposable plastic, cotton tote bags, reusable batteries, etc. We also include destination-specific information in our guidebooks, which are provided to each traveller including information particular to the local culture and environment and tips on how to be a responsible traveller. Do some research on the places to visit.